Kids will enjoy reigning in this colorful castle and feeling like a princess. Designed with rounded walls and four spires for added dimension. Bouncing is the perfect way to promote a child's health, and will keep every princess in great shape. This jumper has 360-degree mesh windows, so parents and spectators can have a clear view of all the fun. Our moonwalks are made safe and secure with lite n strong , fire-resistant vinyl making it safer, portable and more durable. PICKUP TRUCK OR TRAILER REQUIRED TO TRANSPORT; WE DO NOT LOAD CARS, SUVS, OR VANS. DELIVERY/PICKUP IS AVAILABLE AT AN ADDITIONAL FEE. MEGA POP POPCORN KIT 8OZ. 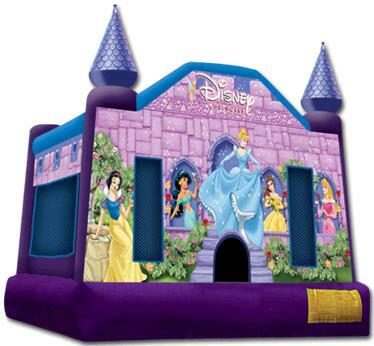 * Please call us for any questions on our princess 13 foot x 13 foot bouncer rentals in Rocky Mount and Wilson NC.